U.S. President Donald Trump reviews an honor guard during a welcome ceremony, escorted by Japanese Prime Minister Shinzo Abe, at Akasaka Palace in Tokyo, Nov. 6, 2017. Confronting the North Korea threat takes partners, and Japan is among America's most reliable allies in Asia. But lately, Japan is feeling increasingly left out. Japanese Prime Minister Shinzo Abe is trying to do something about it, meeting with President Trump in person on Tuesday in Mar-a-Lago, Fla. It's happening just as Abe faces roiling political problems at home. Just before Abe headed to the United States, typically tame demonstrators in Tokyo made an unusual show of defiance, breaking through police barricades to get closer to Japan's parliament, the Diet, to protest the prime minister's leadership. In cities around the country, an estimated 50,000 Japanese took part in demonstrations calling on Abe to resign. Their posters read, Abe, "You're a liar." "I don't trust him. The whole system. Because they've lied time and time again and this is not the only time that that's happened," says 21-year-old Yukino Baba, a college student in Tokyo who took part in the protests. She says she's furious over cronyism scandals involving sweetheart land deals and evidence top Japanese officials doctored public documents to cover it up. "I do think that he wants to shift the attention of the people from the domestic scandals to international affairs and also appeal to the masses that he's doing his job properly," Baba says. A Nippon TV poll released Sunday shows support of Abe and his cabinet has fallen to 26.7 percent — the lowest since he took office in December 2012. "He's got these two cronyism scandals brewing in the Diet, suddenly he gets whacked by Trump. It's been a bad couple of months for Prime Minister Abe," says Jeff Kingston, who is Asia studies director at Tokyo's Temple University. Whacked — both economically and diplomatically. Unlike other allies, Japan isn't exempted from new U.S. tariffs on steel and aluminum. Japanese regulators were accused by President Trump of dropping bowling balls on American cars. (Fact check: not true.) And, Japan got left out of fast-moving diplomacy brokered by South Korea that could lead to a U.S.-North Korea summit. "For Abe, the big risk is these talks will be inconclusive, they'll be dragging on and in a way they'll normalize North Korea having nuclear capability," Kingston says. Abe attempted to build a rapport with President Trump by being the first foreign leader to visit him after the 2016 election. Abe hosted Trump for golf and lavish meals during the U.S. leader's trip to Asia last year. But the diplomacy seems to have yielded little in return. Now, with the prime minister due in Florida on Tuesday, he's expected to try to make sure Japan's interests are not overlooked. One of them is the issue of Japanese citizens who were kidnapped by North Koreans from beaches and other coastal areas in the 1970s in order to help train North Korean spies. There are believed to be at least a dozen abductees, and Japan has not forgotten them in its previous negotiations with North Korea. But whether Trump can be convinced of bringing up other countries' concerns is an open question. "I think this is going to be a difficult trip for Abe," Kingston says. "But on the up side, how much worse can it get?" As Abe labors to keep the alliance with the U.S. from wavering, Kingston recalls a scene captured via helicopter cameras from November's golf game with Trump. At one point, Abe hit his ball into a bunker. While he was down in the sand trap — he tumbled backward as he tried to climb out. "But the whole image was showing Trump striding down the fairway, oblivious of Abe's problems, Abe all alone," Kingston says. He says, lately, that image has become a metaphor. It takes teamwork to confront the threats posed by North Korea. Japan is among America's most reliable allies in Asia. Lately though, Japan is feeling increasingly left out. The country's prime minister is set to meet with President Trump in-person tomorrow at Mar-a-Lago. NPR's Elise Hu reports on the strained ties. ELISE HU, BYLINE: Just before Shinzo Abe headed to the U.S., typically tame protesters in Tokyo made an unusual show of defiance. HU: Hundreds of demonstrators broke through police barricades to get closer to Japan's Parliament, the Diet, all to protest the Prime Minister's leadership. In cities around the country, tens of thousands took part in demonstrations calling on Abe to resign. Their posters read, Abe, you're a liar. YUKINO BABA: (Through interpreter) I don't trust them - the whole system - because they've lied time and time again, and this is not the only time that's happened. HU: Twenty-one-year-old Yukino Baba is a college student who says she's furious over cronyism scandals involving sweetheart land deals and evidence top Japanese officials doctored public documents to cover it up. Abe has denied involvement. BABA: (Through interpreter) I do think that he wants to shift the attention of the people from the domestic scandals to the international affairs and also appeal to the masses that he's doing his job properly. HU: A Nippon TV poll last week showed support of Abe and his cabinet has fallen to 26 percent - the lowest in his current go-around as Japanese premier. 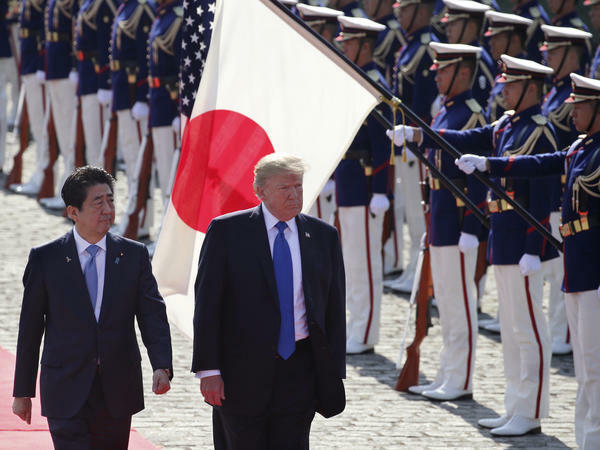 Jeff Kingston, who is Asia Studies Director at Tokyo's Temple University, says the rising domestic anger is happening just as Abe is trying to remain relevant internationally. JEFF KINGSTON: He's got these two cronyism scandals brewing in the Diet. Suddenly, he gets whacked by Trump. You know, it's been a bad couple of months for Prime Minister Abe. HU: Whacked both economically and diplomatically. Unlike other allies, Japan isn't exempted from U.S. tariffs on steel and aluminum. Its regulators got accused by the president, inexplicably, of dropping bowling balls on American cars. Fact check - not true. And Japan got left out in fast-moving diplomacy brokered by South Korea that led to a potential U.S.-North Korea summit. KINGSTON: For Abe, the big risk is that these talks will be inconclusive. They'll be dragging on. And in a way, they'll normalize North Korea's having nuclear capability. HU: Abe attempted to build a rapport with President Trump by being the first foreign leader to visit him after the 2016 election. He hosted Trump for golf and lavish meals during his trip to Asia last year. But the diplomacy seems to have yielded little in return. Now the prime minister is trying to make sure Japan's interests aren't forgotten. KINGSTON: I think that this is going to be a difficult trip for Abe. But on the upside, how much worse can it get? HU: As Abe labors to keep the alliance with the U.S. from wavering, Kingston recalls a scene captured via helicopter cameras from November's golf game with Trump. At one point, Abe hit his ball into a bunker. While he was down in the sand trap, he tumbled backwards as he tried to climb out. KINGSTON: But the whole image was showing Trump striding down the fairway oblivious of Abe's problems, Abe all alone. HU: He says, lately, that image has become a metaphor. Elise Hu, NPR News, Tokyo.